Timeflies — My time is like water. Evaporating and gone. 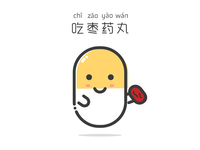 chī zǎo yào wán — 这是吃枣药丸;) In Chinese it's homophonic to the phrase "be doomed".